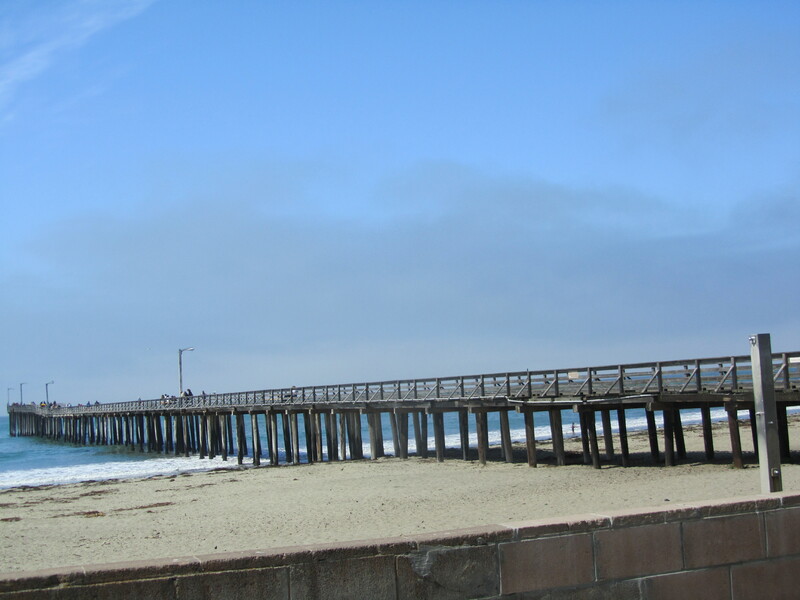 I found perfect weather in Cayucos, California and you all are welcome to come and sample it to see if it is for you. There are overcast mornings, cool and fresh breezes blowing all day long and you do not have to put on sunscreen until about 3 or 4 in the afternoons, or even at all. The weather here in Cayucos is the most perfect way to bath your body in luxury. 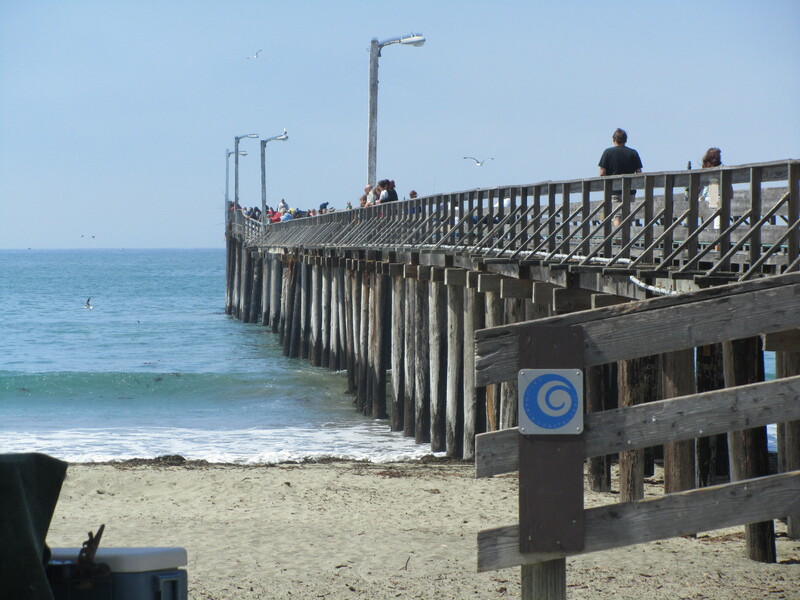 What am I not telling you about Cayucos? I am not telling you of the life at the water’s edge. It is lovely at first glance, until you see mold and ravages of the sea on the structures and the inhabitants. There is a constant maintenance going on here. It is just mother nature at work. Nothing more. Now let us delve into the soul of Cayucos. I do not know how it is for each person because it is an individual thing. One thing noteworthy in the soul arena is that I was able to buy some things in this town worthy of having and remembering. Three sugar shakers and a bracelet with ten squares and engraved on each square is one of the Ten Commandments. I enjoy being reminded as I read and re-read each one. Do I need to be reminded? Yes, we all need to be reminded believe it or not at all ages and stages. It is a connection with something of the ages. It is another root among roots that keep us upright and keep us from toppling over. Another warm and wonderful time in Cayucos and the surrounding area is the time we spent with dear old friends. I do mean old in all ways. I hate to admit the truth and the truth is we are now considered senior citizens in line for miniscule discounts and handicapped parking stickers. Being a senior offers some prizes, but if you think of anything you would rather have that being a senior offers in exchange for youth, let me know now. Now that I am home and away from the seaside, I realize that while visiting this area, it seems that everything is civilized on the outside for a guest to see, but what is seething on the inside I will never be privy. How do I know there is seething deep within, because, there is seething everywhere and you don’t see it; you just have to know and respect that it is there. People want to talk with you, people want to share information, too much at times, and the children look wholesome and fresh. Why am I even bringing this up? I wonder unto myself. Now that a little time has passed, I can tell you one thing. I was double charged on my Visa for our stay. I was charged for our rooms and the rooms of another guest. Now, certainly this is an innocent error, or is it that economic times are so bad this B&B needs the extra income? I know that it has taken me three days to get a hold of anyone with any authority at this establishment. I explained my dilemma and now, they have not called me back. I am being tortured. I can’t slander their name, but you can see the pier if they give you an ocean front room. I mention the pier because upon arising, just before coffee you can walk along the pier to the very end have a conversation or two with the fishermen and then return to the double charging Inn, and have a lovely little breakfast. 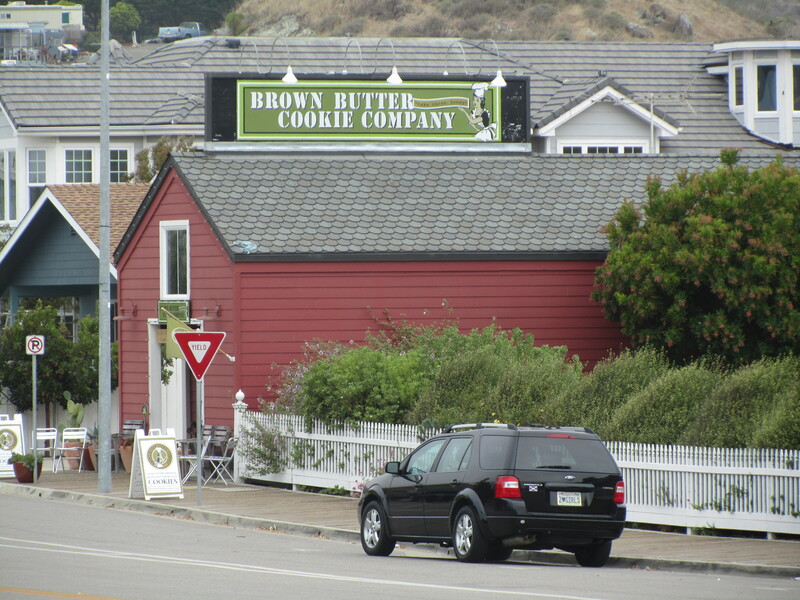 Our window/patio view showed us places to explore as well: Here is a view of the Sullivan Butter Cookie Company taken from the patio. We decided to walk over there to see what was happening because of the crowd around the front doors. Look what we saw. You are right, people hand making these wonderful cookies. 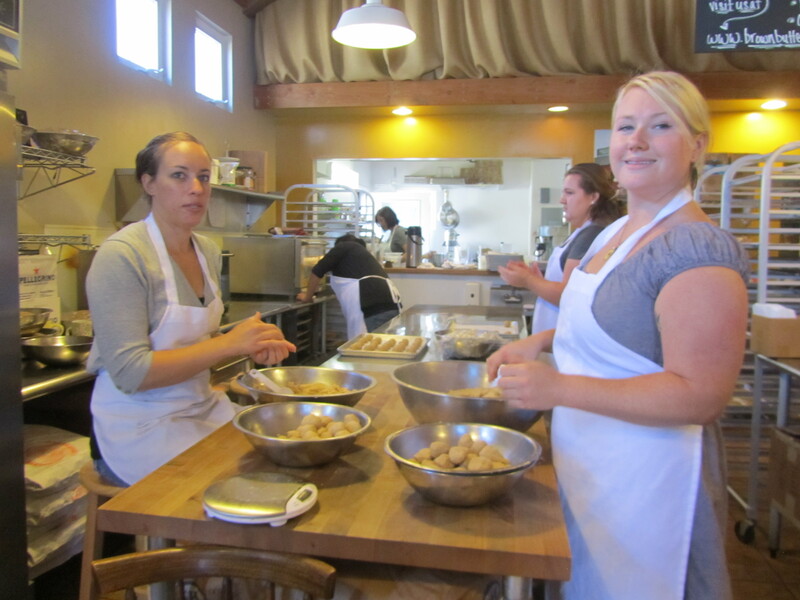 You are also treated to a wonderful taste test of cookies for purchase. Oh yum. Now keep looking at our patio sights and you will see Duckie’s Chowder House. I have it on good authority that the Manhattan Chowder is delicious and from the looks of everyone eating and licking their chops everything is good in Dickie’s. 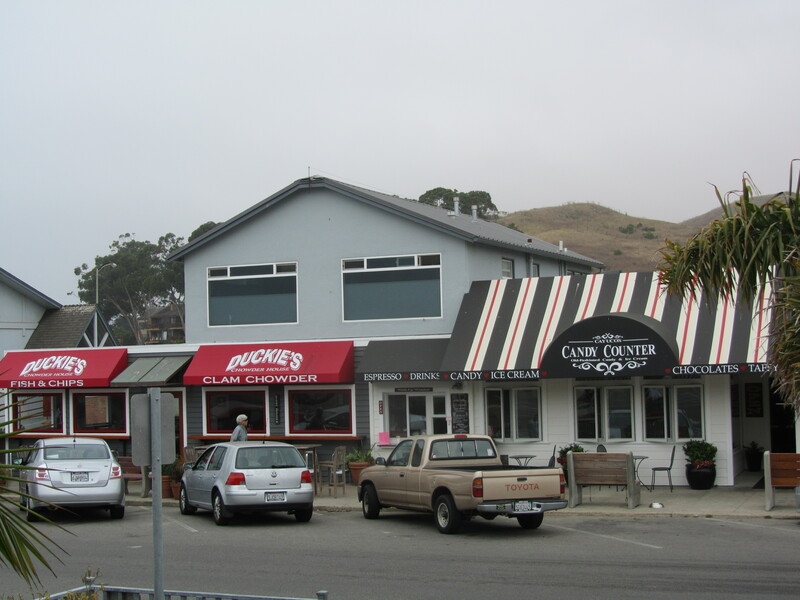 Look also at the view of Cayucos Candy Counter with old-fashioned ice cream and candy. You do not know how hard and long I have searched for old-fashioned ice cream and to have it right outside my patio window, as well as hand made butter cookies and Dickie’s lip smacking good food is a travel discovery extraordinaire. We got off the next morning to visit the sights and sounds of Cambria. 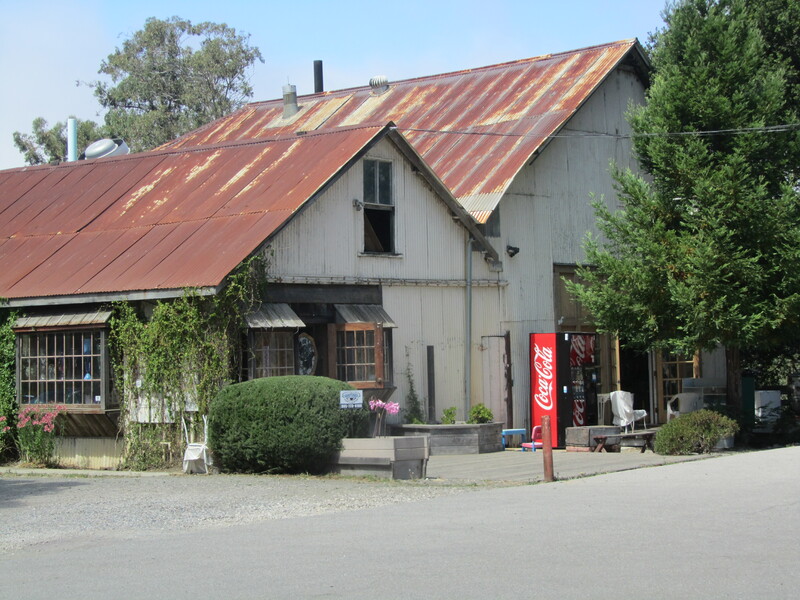 But, wait along the way you have to stop in the town of Harmony with a staggering population of 18, including kids, cats, dogs, raccoons and local ranchers. 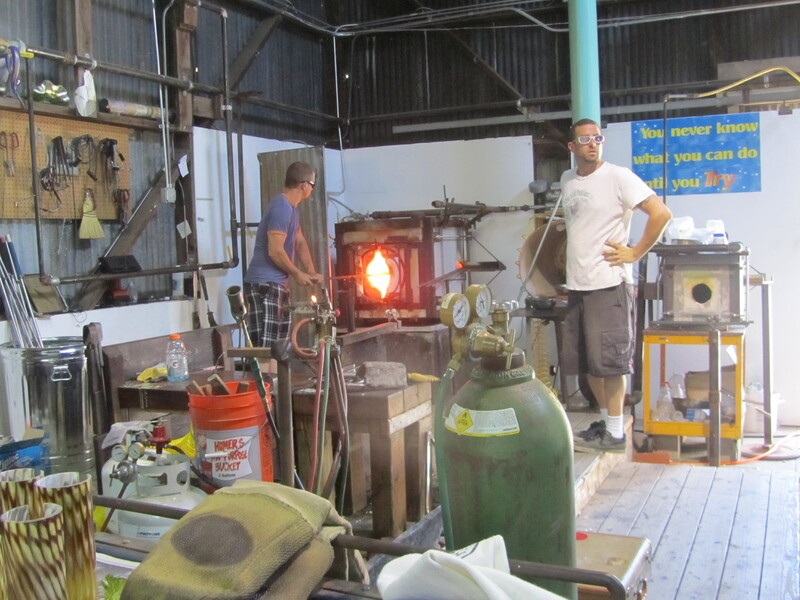 First, you see the ranches, then, little homes and finally, you visit pottery making and the glass blowing building. You have been immersed in a world ago and subsequently you are transported to discover another point in time. What a delight.